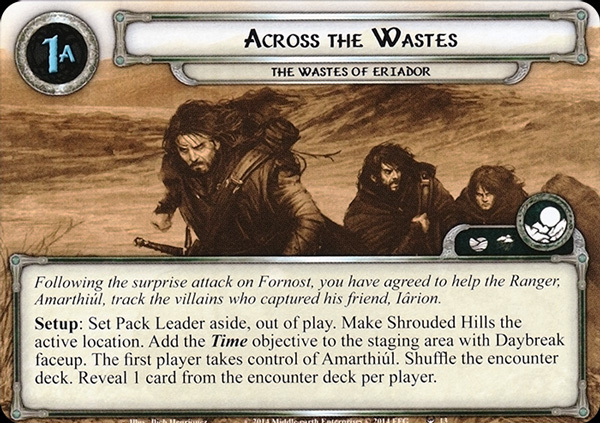 Following the surprise attack on Fornost, you have agreed to help the Ranger, Amarthiúl, track the villains who captured his friend, Iârion. Setup: Set Pack Leader aside, out of play. Make Shrouded Hills the active location. Add the Time objective to the staging area with Daybreak faceup. The first player takes control of Amarthiúl. Shuffle the encounter deck. Reveal 1 card from the encounter deck per player. 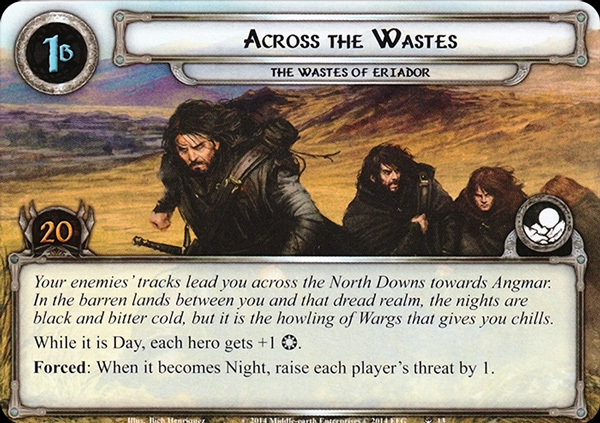 Your enemies' tracks lead you across the North Downs towards Angmar. In the barren lands between you and that dread realm, the nights are black and bitter cold, but it is the howling of Wargs that gives you chills. While it is Day, each hero gets +1 . Forced: When it becomes Night, raise each player's threat by 1.